I have been a long time fan of the Is My Blog Burning events originally conceived by Alberto, but have never participated since I am never organized enough to plan for the submission date. Today, at the prodding of Karen, I decided to make an entry. I just hope it makes it on time, as it is kind of late. So pleeease Cathy, accept my entry? Anyway, for the longest time, I had wanted to try making a cassoulet type dish, but I also wanted to use my sand pot that has become more of a kitchen ornament than a utensil. I didn’t have time to get all the ingredients for a proper cassoulet, so once again, I improvised. Here is my humble offering, which I’m happy to say came out quite delicious. I started out by quick soaking a half pound of dried Great Northern Beans. To quick soak (slightly amended from the package direction): boil beans for 5 minutes, and let it soak for 1 hour. Marinade 2 pork chops in: salt, pepper, garlic powder, balsamic vinegar, olive oil. In a pot, heat the olive oil and sautee the onions and garlic until translucent; add the carrots and celery and cook for a couple more minutes. Add the can of tomatoes, basil, bay leaves, water and chicken bouillons and bring to a simmer. Drain the beans, and add to the pot. Simmer for about 30 minutes. While the beans are simmering, in a skillet, brown the pork chops on both sides. When they were done browning, I added the remaining marinade and let it caramelize. Place the pork chops in the clay pot and pour the bean mixture on top. I had about a cup of the bean mixture left over since the clay pot was not big enough. Cover the pot, and put in a 350-degree oven to bake for 2 hours. 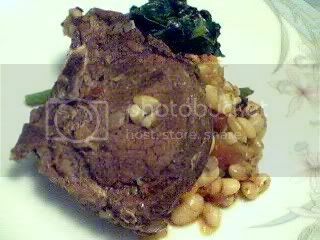 I served this with turnip greens sauteed in garlic and olive oil. It was delicious! Will definitely add this one to our regulars list. Hi Y’All!!! Thanks for visiting and for the nice comments 🙂 It does my spirits a lot of good when others appreciate my experiments, and this one was one! I am really happy about the way it came out though. Makes me wish I owned a clay pot. Yum! Hi Jeanette! Gosh this looks good! 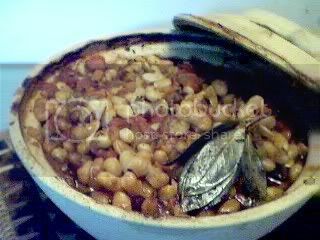 The parallels with Boston baked beans are really interesting…they’re also “pork and beans” and are cooked in a clay pot! This sounds so good and actually quite different from my usual pork and beans (which are sweet). I’m going to have to add this to the list of bean recipes I want to try! Thanks so much for participating in IMBB 11! that is one hot pot 🙂 your cassoulet looks wonderful–i can almost smell it from here! Oh, just by the looks of it I can almost taste the richness of combination all those ingredients and cooking them in a pot. Mouthwatering! 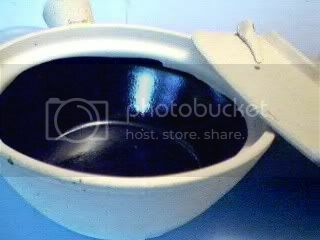 I love your clay pot so much. I never thought about cooking beans in a clay pot, but it must be good. This looks like a must-try. Hi JMom. I like slow, claypot cooking and this one is a must-try. Lovely!